It’s a new year, and that means it’s time to focus on your blog, right? I don’t know about you, but when I start a new year, I am filled with amazing new ideas. It’s not too late to start changing what you are doing to get blog traffic for your new blog. Increasing blog traffic whether you’re a new blogger or seasoned blogger is still on everyone’s mind. It is on my mind! I have several blogs that I’m juggling (barely! ), and each one has their own blog traffic strategy and tactics. But, when you think about it, since I started Twins Mommy, a lot has changed ragarding traffic growth tips. Pinterest has changed their platforms in the last year with adding hashtags, sections and a follower tab. Facebook has changed too. Organic reach for your Facebook page is decreasing with every new update. They are emphasizing different things like personal connections and valuable posts rather than promotional posts. This means that Facebook groups are a contender for growing your blog traffic. These two platforms have helped me immensely grow my traffic to over 62,000 pageviews. 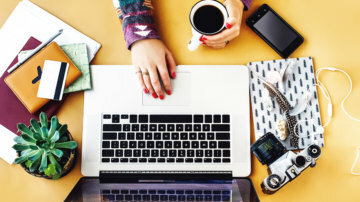 So, what can a new blogger start doing in 2019 to see traffic growth sooner rather than later? If you need some quick blog traffic tips and have no time to read this post, check out my video on growing your blog traffic. And I would love it if you subscribed to my YouTube Channel. So you recently started a blog, and you have some blog posts up. That’s great. This is your start, and I want you to continue to create content. But, if you plan on monetizing your blog in the future, you’re going to have to change slightly what you’re doing right now. Start focussing on creating optimized content to drive traffic. This is a type of content that is share-worthy. How do you create share-worthy blog posts? Think of your blog as a way to help others with what you know. Share your advice and helpful tips to your audience. Personally, I only visit blogs if there’s something for me. Will this improve my (fill in the blank: blog, business, my twins from fighting) right now? Can this inspire me to change what I’m doing? So, when coming up with a blog post idea, think about how you can turn what you know into helpful advice. Let’s go through an example. You homeschool and have three children. You’ve learned over time how you can balance nurturing your children, teaching your children and reserving time for yourself. You want to share this tip with your audience on your blog. You can do this by first tailoring your headline to attract your audience. You have to make it worth it to click on your blog post title. Then you create an outline that focuses on your reader. You share the challenges of finding time for yourself while homeschooling or having three children under 4. Then you provide the advice that is helping you find time for self-care. This is a helpful outline that will help a reader. Ask, what’s in it for my reader? Am I helping my reader? Will this change how my reader will do things? It’s a fact that evergreen posts that are in-depth (and long) provide immense value over a longer period than a shorter post that’s seasonal. You’ve seen it on Pinterest when a seasonal post picks up during that time of the season but doesn’t generate traffic outside of that season. While it’s okay to create seasonal content on your blog, you need to fill your blog mostly with evergreen content. These are blog posts that can stand the test of time. Moz reviewed over 1 million articles and found that the majority of blogs are less than 1,000 words. But, you know what? 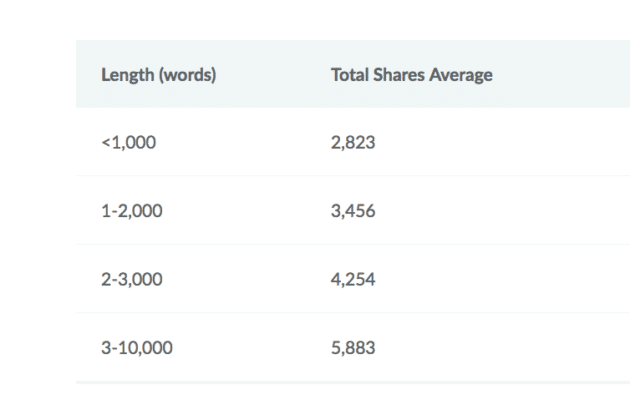 Blog posts that are over 3,000 words get the MOST shares. Longer blog posts just have more value. It’s unlikely that a longer blog post is filled with fluff information. It is helpful, actionable and can even be data-driven. So, if you’re new to blogging, how can you do this? First, set a goal of creating 1-2 in-depth guides based on your blog niche. These are posts that are like a mini tutorial, a How-To, or list post. Now, don’t get hung up on doing this if your niche doesn’t allow it. Can every niche create big in-depth blog posts? No, but many can. For example, let’s look at the DIY jewelry niche. You can create a valuable blog post to help someone get started with DIY jewelry making. This can be a post outlining the materials needed, certain skills you need, quick basic tutorials on pre-steps to jewelry making, and then how to sell your jewelry. Then guess what? Then you can create another guide to selling your jewelry on Etsy. This can be an in-depth guide. If you have a lot of blog posts that are similar in topics, then create an ultimate guide. For example, I have a lot of blog posts on Pinterest. I can create a beefed up 10,000-word guide on getting started with Pinterest. If you have a parenting blog filled with a ton of newborn tips, why not create the ultimate guide on the first month home with your baby? Look at your blog posts and see if you can consolidate them into one big guide. Creating these types of guides takes time. If your blog is barley three months old, give yourself more time before you publish your guide. You need to learn about blogging, promotional strategies and more when you’re new. While you can launch your blog with 3 or more flagship blog posts, it isn’t necessary. When you’re ready, make that a project for your blog. Okay, let’s get back to the original post idea 🙂 This is about blog traffic tips for 2019. The next tip after focusing on optimizing your content is to test and try new things. As a new blogger, you are reading and absorbing as much information as possible, right? So, you know what’s going on, but you may be hesitant to do that for yourself. I know. I was the same. I knew for years that video was the way to go. But, I dared not try! I’m an introvert and awkward. Who would want to hear and see me? But, I knew that if I wanted to grow as a blogger and learn new skills for my business, I had to try new things. So I started doing Facebook Lives. At first, I was terrible. My lighting was terrible, I didn’t talk loud, and you could tell I was nervous. But, I DID IT! And, the more I did it, the better I got. I’m not a professional video person. I’m still nervous and mess up a lot, but that’s okay. I guess that’s part of my overall brand. Content Upgrades – I hadn’t tried content upgrades for my other blogs and felt that this was my main way to increase my email subscribers for Twins Mommy. Using Pinterest – before I started Twins Mommy, I didn’t really use Pinterest as a marketing platform. I was on Pinterest and marketing my freelance writing blog, but it was organic and not automated. Tried Social Media Automation Tools – I started using Tailwind to help me promote my new and old blogs. Started Using Teachable – Although I had a course out, I never hosted it on a course platform. Yikes! Yes! In 2019, it’s now a thing. To grow your brand and business, start using video. It’s scary for sure, but it can be done for the new blogger. Last year and this year I’ve created more Facebook Lives than I did when I first started Twins Mommy. And I will continue to create video. You can do Facebook Live, YouTube video, Instagram Stories and who knows another platform that will explode? For us – the blogger – I would focus on those platforms for video marketing. To help you understand more about video, make sure to check out Jessica Stansberry! And if you want to start doing Facebook Lives, make sure to check out my guide! If you don’t feel comfortable with doing this, you can get started with video by doing a free course or a paid one too! 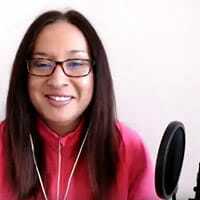 Teachable allows you to get started with for free and you can create a free video course that can be used as a freebie to grow your email list. Phew! 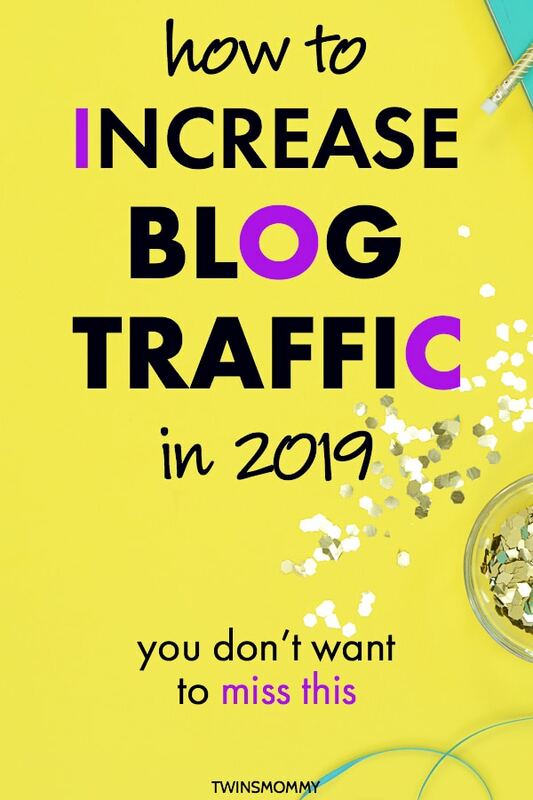 2019 is the year to increase blog traffic for you! Focus on optimizing your content, and you should be good! Then from there, start incorporating video and, you should skyrocket! 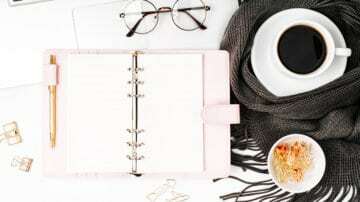 Please tell me your blog traffic plan for 2019! I want to hear it! Re-read this for the several-eth time and I always come away with new ideas for my own blogs! Being a new blogger this is practical and very helpful so thank you! That’s great to hear! So happy! Hi Elna, I definitely will try out Facebook Live and try videos in 2019. Thank you for the wonderful ideas. Will be trying them out. You’re welcome! Glad you are stepping out of your comfort zone and trying Facebook Lives! You go! If I could only accomplish everything that I want to, It would be great. Since I needed to get my blog up and running in no time (I did it in two months), there is a lot of work just to improve my content for SEO purposes. Right now, I’m focusing on growing my Pinterest and IG account to drive traffic to my website, but I also want to be on Facebook, Twitter, LinkedIn and YouTube. Besides all of that, I wrote a 5000 word e-book, that needs to be jacked up to 10k to be ready for Kindle. My opinion is that this book will drive a lot of targeted, already engaged, visitors to my website. As you mentioned on point no. 2, I will keep experimenting and trying new methods for getting more visitors, but also to deliver great content. That’s awesome! Glad this post about boosting blog traffic helped you tweak your strategy! Hi Elna! I love your positivity but also the dose of realism. I’m a new blogger and feeling a bit discouraged wishing I had more traffic. This post gave me a sense of where/what I should be doing, and I appreciate your advice. Thanks again! You’re welcome! Increasing blog traffic is a recipe. It really is and if you have all those components, you will grow your blog traffic 🙂 So keep at it! I consistently run across your blogs in my Pinterest home page. I always get hooked in but I really love your content. You give such great information with each post I read. Thank you. Very good post. This has helped me so much. Love this post, very good information. Thanks for the Utimate Guide tip! I’ve written that down on my to-do list as I’ve just gotten a light bulb moment for three blog posts that I can write a guide on. I’m also thinking of updating a couple of blog posts. Some article that I wrote sometime ago are about 7/800 words and the info is outdated now. I’m hopeful that will bring in some traffic too. That’s amazing! Glad your got that a-ha moment here!!! Yay! Hi Elna, Me again. I have another question. When you mentioned an ultimate guide of connected blog posts already written, do we have to take the posts down and consolidate them into one new (long) blog post or start a new post with explanations and links to the other posts. Thanks! When consolidating posts, you just use the information (not the examples or wording.) For example, if I did a big Pinterest guide, I can talk about keywords, sections and your profile in this guide. These are actual three blog posts on Twins Mommy! ha!! Then I can link to those three blog posts in the guide. Boom!! Connection and lower bounce rate with big guides! I’ve been a part of your Facebook group for awhile and love your wealth of information and resources! I’m glad you’re going to be talking about guest posting soon because that is how I got 8k pageviews my first month of blogging. Your free ecourse Get Paid to Write was very influential in that process. Unfortunately, things have slowed this month and, especially since Pinterest took a dip, I’m looking for other ways to increase traffic. After reading this, you have me inspired to try videos eek! Definitely pinning this one for later! Thank you so much! I love getting to know my audience and Facebook group members! Yes, I can’t wait to tell the FB group about guest posting soon!!! Yay! Glad this post got some more ideas to grow your blog traffic since Pinterest isn’t being nice to us bloggers!! You’ve got some great tips in here. I feel really inspired after reading it to try new areas with my blog like guest posting and making some freebies. Thanks and I really love reading your posts!! Love your blog name!!! Sweet! Thanks so much. Good luck with guest posting. I can’t wait to share something soon about guest posting on my facebook group Mom to Mompreneurs!!! Hey Elna, You mentioned that growing your blog traffic is the number one thing you should do. I’m wondering what the magic number is. I know this is hard to say depending on so many factors, but if you had to throw a number out there, what would you do? Also, we recently did 8 posts in 8 days (one of your suggestions – except the number was 12) and hopefully this will bring in more traffic. Also, 3,000 plus words might kill me as a writer. And I write fast and a lot. I’m wordy. But that tip is great to keep in mind. That is a very hard question, because it’s all based on a lot of factors like your monetization strategy. For example, for me, I was making at least $100 a day at around 25k pageveiws for Twins Mommy. But, for other sites that get 100,000 pageviews, they aren’t making anything. For ads, look to get maybe $50 at 25k pageveiws. Then if you add products that changes because you can rely on your email list. But to get that big email list you need to market your blog and get traffic (i.e. eyes to your landing pages). My strategy is traffic. I get social traffic and then Google traffic and once I get that magic Google traffic, then I’m good. It’s consistent and profitable. Other bloggers, don’t worry about traffic and use other ways to create income like a YouTube channel for example. So, sorry if that didn’t help much! You’re doing a great job. I’m seeing your pins on Pinterest more and your posts on FB too! Thanks for your detailed response. My eyes have been on my mailing list, but now I’m going to look a little closer at traffic. I hope for some of the Google Juice soon myself. Love your tips. And I’m glad you’re seeing my pins. Cuz I see yours! And I pin em (cuz they’re great)! Hey, Elna! I super love this! You’re really up to date with all the things that are working well, and you don’t make it sound like a 3-hour lecture with all the jargon and technicalities that’s usually in guides like these. My 2018 plan for blog traffic has been using your Pinterest guide, and WOW! Most of my views and traffic really /are/ coming from there. I mean, I probably average 100 visitors a day (which is tiny right now, but it’s a real good start to me!) and about 80% of those come just from Pinterest (sometimes even up to 90%). Thanks so much. I’m so glad you found some good tips and strategies to grow blog traffic in 2018. I can see how having a bad internet connection isn’t great for FB lives. Hopefully it will resolve soon? You can try other media content like podcasts? Those are popular too. So happy that the Pin Promote Planner is helping shape your traffic from Pinterest! Love hearing that! Thanks for stopping by! Hi Elna, I am so happy you wrote this post when you did. I plan to feature it in my post about your and your Blog Traffic course. I’ve been blogging for years but I used it as a tool to drive traffic to my website so I can gain web design clients (back when I was a designer). Now that I am a Pinterest manager or some like to call VA. I am not only interested in growing my traffic for clients but also make money through affiliate marketing. That’s great to hear. Thank you for wanting to feature this post and my course! It means a lot to me. I’m sure your service can be used for a lot of bloggers! Good luck! Super helpful! You’ve included some great ideas. Video is something I am really anxious about — I know I should probably do it, but I am not sure of a topic and we have so few subscribers anyway. But it is going on my goal list for Q3. Thanks for the push! Yes, video was a BIG challenge for me. I’m still not comfortable on the camera and you can tell. I have to personally have everything perfect before I go live and stress myself out. Then when it’s over I’m totally drained and have to take a break before I go back to blogging! It’s a lot for sure, but I know it has a high ROI! That’s great you’re making this a goal in Q3! You can do it! These are great tips. It’s surprising that such long content gets the most shares. I always assumed people have short attention spans when they are reading online. You’ve inspired me to give that a try. I love the idea of combining a few posts into an ultimate guide. I know right? I’m always thinking that when I write these 3k-4k word blog posts. But, people book mark them for later! Awesome that this inspired you! Can’t wait to read your longer posts! You give such great tips here, Elna! However, it’s safe to say that 2018 is the year of taking risks for me, so I’m definitely going to push myself to make it happen before the year is out! I remember seeing you in some summit that I was in and I LOVED it. You did great! My FB lives are NOT the greatest. I make errors all the time (in my writing and in my LIVES..go figure). But, oh well, people still enjoy them because I’m providing good info. I did a 5 day freelance writing tips as my first introduction to FB lives. Why not try something like that. Do a quick 5 minute tips on X for 5 days and see what happens! Hi Elna As always, a great helpful post. My blog is 6 weeks old so I am trying hard to get more engaged traffic to my blog. This is what I’m working on to realize that goal – creating better content. A tip I got from a post by Neil Patel is to use LSI keyword generator. If you use the given KWs or some of them, you automatically create long-form content. I have problems writing posts as helpful as your always are but to help with that I use the ‘ people also ask ‘ and related to Google search. To get more traffic, I’m setting up a resource library on my blog, placing more inciting and inviting subscriber forms on my posts, improving the quality of my pins to get more repins and working on a great opt-in. But, as you know, it all takes time. Thanks for being an inspiration. Wow, only 6 weeks eh? I know you’ve been around in FB groups a lot longer I think since I feel like I know you already! You’re doing good! Take all the info you can get for sure. Yes, a resource library can help with the freebies you create to grow your email list! Good luck! Thanks so much for these tips! I’ve been blogging for about 6 months already and the learning never stops!! I know, right? I’m still learning on different ways to increase blog traffic!